This week we talk about what we’ve seen of RIM’s Blackberry 10 at BBJam America 2012, webOS going open-source, and the newest edition of the Razer Blade gaming laptop. There’s no denying the business and enthusiast populace that still follow and rely on RIM’s only child. There is possibly denying BlackBerry’s ability to catch up to other platforms–or better–to maintain their position. Nonetheless, the new BlackBerry 10 OS is tantalizing fans with the new devices set to launch first quarter 2013. While the phones have not been announced, much of BB10 has been unveiled at BlackBerry Jam (yes, haha) this year, just in the past days. As far as features, BlackBerry 10 has a lot of user-friendly and work-efficient design in software which is relatively original. The BlackBerry Flow view shows all active apps, allowing users to scroll smoothly through all open apps. BlackBerry Hub consolidates messaging and emails from a number of sources, and BlackBerry Messaging contains instant messaging and social networking. While the BB10 developer phones have gotten hands-on, the real heroes have only supposedly leaked with an advertising video (which was removed from most sites, but can be seen on BGR). The full touchscreen L series phone features a new predictive keyboard feature, more advanced than previous attempts at the technology from other phones. The N series has the traditionally understated, yet highly glorified hardware keyboard. Both phones have a pretty slick, modern design. Some analysts predicted the possibility of BB10 never making it to market, but it looks like BlackBerry is getting a chance for resurgence. More on BB10. 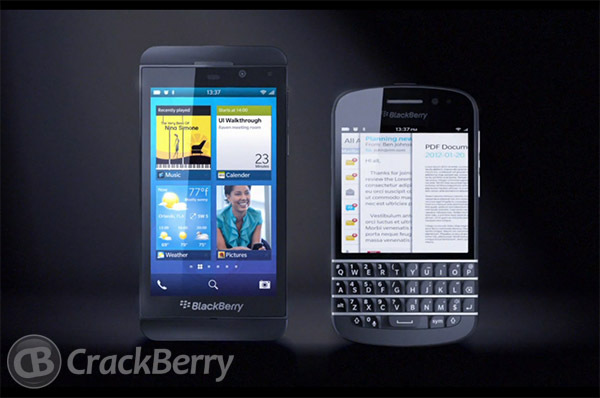 The Blackberry 10 L series (left) and N (series) will tote RIM’s latest software. It wasn’t all too long ago that the Palm line of devices would be considered a top competitor in the smartphone spectrum. Maybe you remember those phone commercials with the really white lady? The smartphone operating system webOS hasn’t yet gone away, although it has passed under discontinuation of production by its owner HP. Despite all it’s had to overcome, the OS and its surviving fans have transitioned to a new phase of its existence. HP has made it open-source, and can be ported to any device now without worry of licensing. Already, the phone operating system has been ported to an Asus Transformer Prime and Galaxy Nexus. More at webOS Nation. Laptop gaming has hardly ever been glorious, until now. Generally requiring heavier components, bulkier processors, and extra space for fans and cooling, gaming laptops have rarely been “portable”. Last year, the first generation of the Razer blade was unveiled with impressive specifications, and this last week, the second generation has been released. If you’re a PC gamer looking for portability, this should be one of your top considerations. With a 3rd-gen quad-core Intel Core-i7, a 1920 x 1080 resolution 16:9 screen, and a .88″ (2.24 cm) thick body, this is one impressive device. See the site. Posted on October 1, 2012, in Technology and tagged BBJam 2012, Blackberry, HP, L Series, N Series, open-source, Palm, Razer Blade, RIM, WebOS. Bookmark the permalink. Leave a comment.